Because the cars affected are now between 10 and 17 years old, issues over the Mercedes Benz Mobilo Life 30 Year warranty against rust perforation are gradually going away. This was a huge problem 10 years ago. So serious that the front suspension coil spring perches on W210 E-Class Mercedes were collapsing due to corrosion. But Mercedes put its hand up and repaired the dangerous cars free if charge to owners. And also repaired bodywork up to 8 years old where rusting had occurred due to poor paint preparation and sealing of seams. The issue now concerns older cars. Where rust-through occurs in seams, pressings and bodywork, should Mercedes repair the cars free of charge under the Mobilo 30 Year warranty? Motor Codes, the Motor Trade Standards agency run by the Society of Motor Manufacturers and Traders, says no. This is the reply it sent to reader DS of Bearsden who complained of rust-through on his 2002 Mercedes Benz W210 E-Class. (The photos are not of his car but of another W210 E-Class). The Mercedes-Benz Anti-Perforation Warranty covers you for metal perforation (corrosion from within the metal panel itself meaning the actual panel is infected). This type of corrosion is known as perforation. Perforation is where the metal itself has a defect that starts from the inside of the metal and works its way outwards. External influences are anything other than the metal being infected. Where a fault does occur Mercedes-Benz will consider whether in the circumstances they should make a goodwill contribution towards the cost of repair. Mercedes-Benz will assess your request for assistance against set criteria to determine whether to make an offer of goodwill support. The manufacturer will take into consideration the age, mileage and service history and any other relevant factors, in reaching any conclusion, providing that this criteria is met the manufacturer may decide to offer goodwill support. Please note that Mercedes-Benz do not have to offer goodwill and when they do it is not an admission of liability. Goodwill is offered at their own discretion. 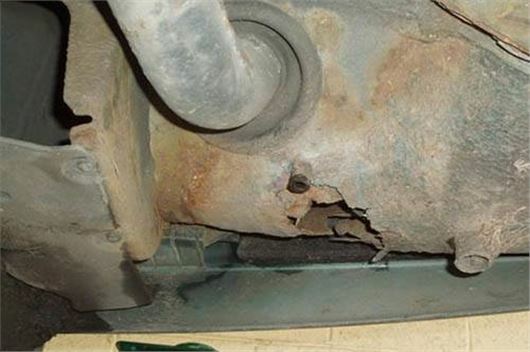 As you already know the previous repair was carried out as a goodwill gesture and was not covered under warranty because they deemed the corrosion on your vehicle at the time was not perforation. In my opinion I do not accept that there is a problem with the Paintwork on a Mercedes vehicle. Every single case is assessed individually and not collectively. Motor Codes cannot use anecdotal information as evidence and we cannot use information from the Internet either as the Internet is not solicited. Therefore I cannot comment about what Autocar, Glasgow Herald and What Car have stated about rust and Mercedes-Benz. If you are having difficulty getting a paint report you may wish to contact Akzo Nobel. They may be able to assist you in obtaining a report. Please note that the paint report will have to state that the corrosion on your vehicle is perforation in order to pursue a warranty claim under the 30year Anti Perforation Warranty. If you believe the paint is not of satisfactory quality, you will have to seek legal advice to establish if you have a potential claim against the seller of the vehicle. By law your contract of sale is with the selling dealer or finance company if the vehicle was purchased on finance. Under the Sale of Goods Act businesses (selling dealer/finance company) may be liable to put things right for you if there is a problem with the quality of the vehicle. The law holds the seller of the vehicle responsible for up to 6 years after goods are sold. However I note that your vehicle is over 10 years old and I believe by law you have no recourse as you purchased the vehicle over 6 years ago and by law the vehicle has lasted a reasonable time therefore the seller would not be liable for providing any remedy. If you manage to have technical evidence like a report for example I will be happy to review your complaint. The photos show the kind of rust that can occur on a Mercedes built between 1996 and 2003. Motor Codes has the support of Consumer Focus, the Trading Standards Institute, the SMMT, the Department for Business Innovation and Skills, the Citizens Advice Bureau, the DVLA and the Office of Fair Trading. Readers may express what they think of this below. As the owner of an ageing MB with the 30 year corrosion warranty can someone explain what this item means. It means unless you can prove that the car was originally built of rusty steel the Mobilo 30 year warranty does not apply. Having looked at this again think the warranty is a tad better than that. I think it will cover perforation starting say from within a box section, cavity or door space. Luckily I have a W211 which is the next model which seems to be less prone to rust although mine had a very nasty mid- life crisis with its electrics when it was 4-5. years old.